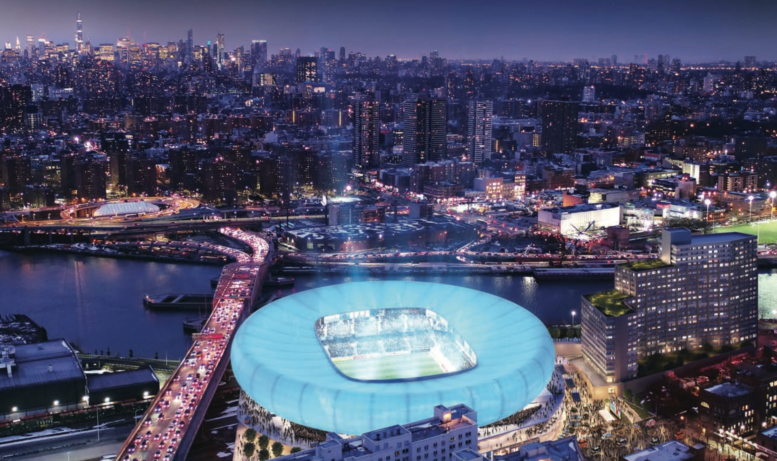 Rafael Viñoly Architects is set to design New York City’s first soccer stadium. Related is spearheading the 26,000-seat Bronx project, which will be the future home of the New York City Football Club. Similar to Hudson Yards, Related’s mega-development on Manhattan’s Far West Side, the stadium will be constructed over rail yards by the Harlem River in the South Bronx. While a deal for the site hasn’t been finalized, YIMBY got its hands on the preliminary renderings for the RFP, which Related submitted with Somerset Partners. Somerset Partners is working on a major project on an adjacent lot, a development with nearly 1,300 units of market-rate housing along 1,200 feet of the river. Given soccer’s popularity in the five boroughs, it’s surprising that the Bronx stadium will be the city’s first. The renderings right now make the toilet seat–shaped arena look more like a massing diagram than anything, but the design is sure to evolve if the city accepts the developers’ proposal. The Architect’s Newspaper (AN) reached out to Viñoly’s firm and Related for comment, and both declined to share any more details on the project. 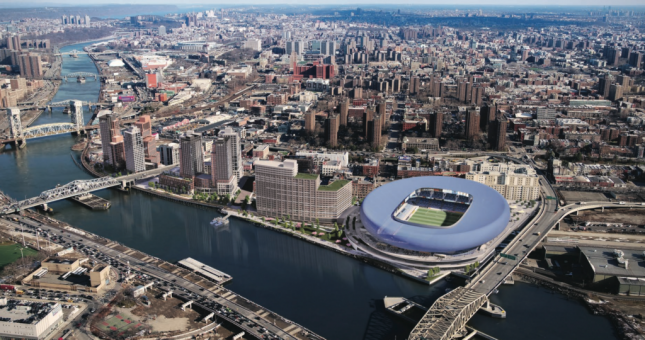 The stadium will be joined by affordable housing in a project the developers are calling Harlem River Yards. The New York City Football Club’s new home and the 550 units of housing will be joined by a medical facility, retail, and an 85,000-square-foot park. Related and Somerset would lease the 12.8 acre property for $500,000 annually for 99 years, and invest $125 million total in sitework and a planned waterfront park. Harlem River Yards is expected to cost $700 million in total, and it’s slated for completion by 2022.